The POS system is a very important component in running a successful fuel and convenience store. It’s a computer hub that connects main systems in a c-store and can be used to instantly update all store prices. By integrating with Gilbarco, a leading manufacturer of site management solutions for fuel stations and c-stores, Watchfire Price Watcher gas price displays automatically sync when fuel prices change in the POS system. This guarantees that gas prices displayed every where at a fuel stop are accurate and up to date. It’s important for gas prices to be current in order for c-stores to stay competitive. When the price of gas drops, Watchfire gives c-store owners the ability to change gas price signs from inside the store wirelessly with a standalone controller. Watchfire customers report that their sales have gone up after installing a Price Watcher gas price display and LED display together. We surveyed c-store owners and listened to their needs and concerns. By helping simplify their operations and allowing them to be more accurate with pricing changes, they can increase their ROI. 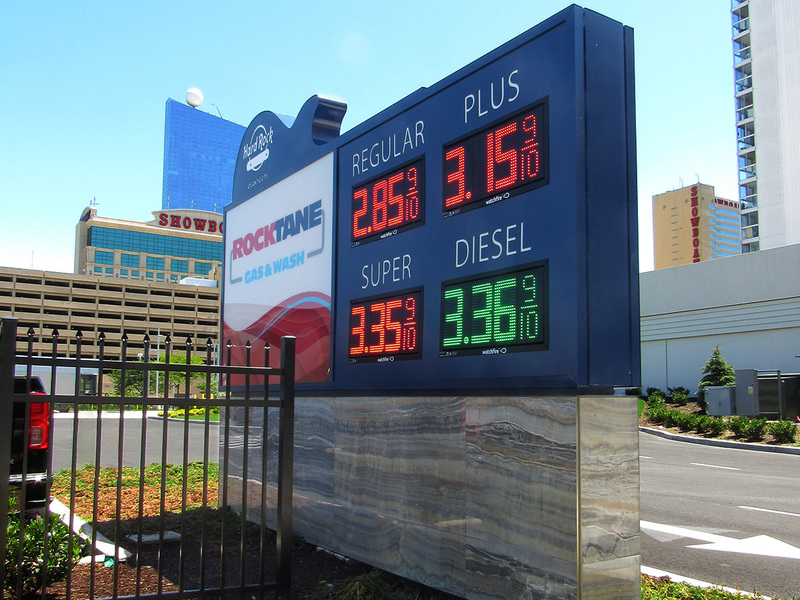 With fully encapsulated modules that increase the life of the product, our gas price signs are built to endure moisture, air-borne salts and heat. The design is windowless, which means nothing will obstruct the LEDS. The design also eliminates glare, and reduces moisture and heat buildup. Price Watcher gas price displays are designed for easy installation. We’ve eliminated the expense of mounting different price sign components. It’s a plug and play solution that will make updating gas prices an easy task at your convenience store location.